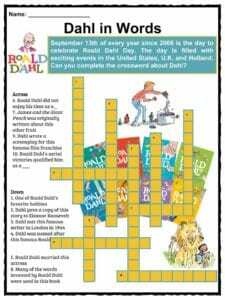 Roald Dahl was a famous British novelist, short story writer, poet, screenwriter and also served as a fighter pilot in the Royal Air Force during World War II. Roald Dahl was a famous British novelist, short story writer, poet, screenwriter and also served as a fighter pilot in the Royal Air Force during World War II. He has been referred to as “one of the greatest storytellers for children of the 20th century”, writing almost 50 books in his career, along with many more screenplays, poems and short stories. 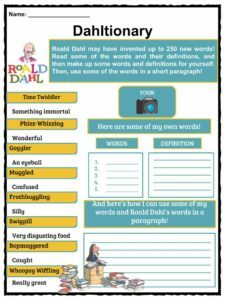 See the fact file below for more information on the Roald Dahl or alternatively, you can download our 23-page Roald Dahl worksheet pack to utilise within the classroom or home environment. 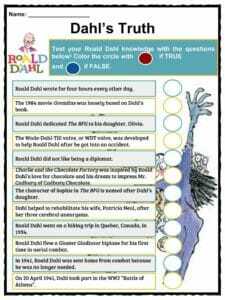 Roald Dahl was born in 1916 Llandaff, Cardiff, Wales, in 1916. His parents, Harald and Sofie Magdalene Dahl, were Norwegian and settled in Wales in 1880. He was named after the Norwegian polar explorer Roald Amundsen. Amundsen was a national hero in Norway at the time and was the first person to ever reach the South Pole. Roald spoke Norwegian when he was at home with his family. 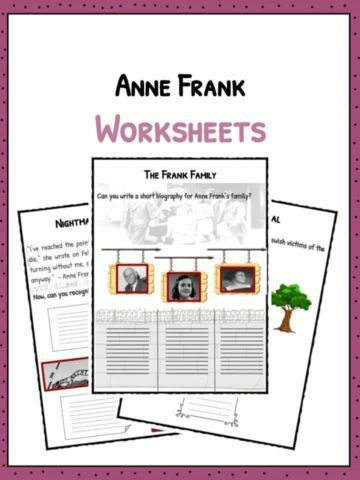 The entire Dahl family, both parents and his sisters Astri, Alfhild and Else, spoke their native language while at home. Roald Dahl’s sister and father both died in 1920. His seven-year-old sister, Astri, died from appendicitis and weeks later his father Harald died of pneumonia at the age of 57 while on a fishing trip in the Antarctic. Dahl went to three different schools in different areas of the country. He first went to The Cathedral School in Llandaff, Cardiff. He was then transferred to Saint Peter’s – a boarding school – in Weston-super-Mare, and then, in 1929, he attended Repton School in Derbyshire. Roald was very good at sports. He was captain of the school squash team and the fives team – fives is similar to squash but you use either a glove or bare hands instead of a racquet. He also enjoyed playing for the school football team. Roald Dahl was a very tall man. By the time he reached adulthood, Roald stood 6 ft 6 in (1.98 m) tall. Photography was another hobby that Roald enjoyed. He often had a camera with him. In 1934, he went on a hiking trip to Newfoundland in Canada. After his hiking tour was finished, he got a job with Shell Petroleum Company and worked in exotic locations like Kenya and Tanzania. Roald Dahl became a fighter pilot in the Royal Air Force in 1940. Before he became a pilot, he was a lieutenant in the King’s African Rifles – an East African regiment of the British Army. In 1940, Roald Dahl was badly injured in a plane crash. He was flying a Gloster Gladiator biplane when it ran out of fuel and crashed in the Egyptian desert. He fractured his skull, broke his nose and was temporarily blinded by the crash. He was able to drag himself away from the burning wreckage and then passed out. Dahl saw his first aerial combat on 15 April 1941 in World War II. He was flying a Hawker Hurricane and successfully shot down an enemy Junkers Ju-88. In late 1941, Dahl was sent from the war back to his home in Britain. He was invalided home after beginning to get severe headaches that caused him to blackout. In 1942, Roald Dahl became a British diplomat. He was appointed as assistant air attaché at the British Embassy in Washington, D.C.
Dahl did not like being a diplomat though, and he later said: I’d just come from the war. People were getting killed. I had been flying around, seeing horrible things. Now, almost instantly, I found myself in the middle of a pre-war cocktail party in America. During the war, Dahl was recruited as a spy for MI6. He was recruited by the Canadian spymaster, William Stephenson, who was known by the codename “Intrepid”. Dahl provided MI6 with intelligence from Washington, working alongside Ian Fleming who would later become the creator of James Bond. Roald Dahl left the Royal Air Force in August 1946. He left the service with the rank of squadron leader and his record of five aerial victories qualified him as a flying ace. On July 2, 1953, Roald Dahl married the American actress Patricia Neal. The wedding took place in New York City and the marriage lasted 30 years. Roald and Patricia had five children together. Their names were Olivia, Chantal, Theo, Ophelia and Lucy. Olivia died of measles encephalitis at the age of seven and Dahl became a proponent of immunisation in later years. He also dedicated The BFG to his daughter. Theo Dahl was hit by a taxi cab in New York City in 1960 when he was four months old. His injuries were severe and he suffered from hydrocephalus (water on the brain). Because of the accident, Roald got involved with the development of a device that helped the condition, which would become known as the “Wade-Dahl-Till” (or WDT) valve. Roald’s wife suffered three cerebral aneurysms. These left her unable to walk or talk until Roald took over control of her rehabilitation and helped her learn how to talk and walk again. Roald and Patricia got divorced in 1983. He went on to marry Felicity Crosland. 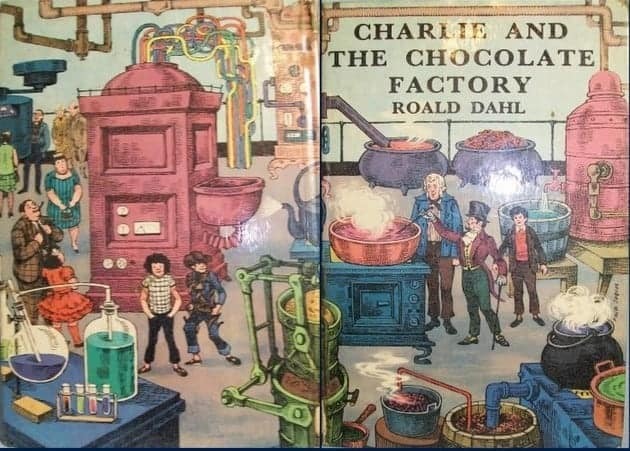 Roald Dahl loved chocolate. When at school in Repton, Derbyshire, he enjoyed chocolate that was sent from Cadbury to the school students for testing. He dreamed of inventing a new chocolate bar to win praise from Mr. Cadbury and this inspired him to write his third children’s book, Charlie and the Chocolate Factory, in 1964. His granddaughter is Sophie Dahl, an author and former model. The Sophie character in Dahl’s The BFG is named after her. 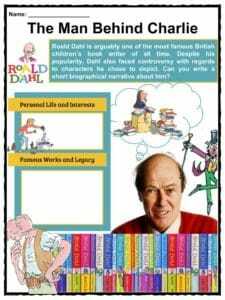 Roald Dahl died in 1990 on November 23rd. He was 74 years old when he died of a blood disease called myelodysplastic syndrome. Many of his books were written in his garden shed. Roald Dahl is said to have had an old, battered armchair in a shed in his garden where he wrote most of his books. 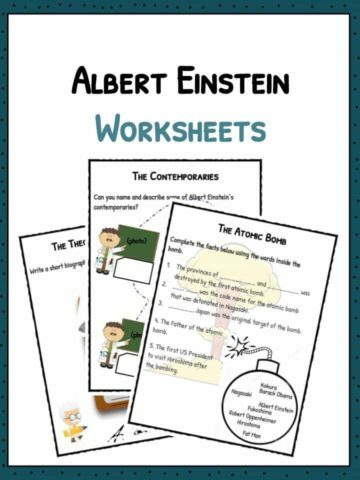 He would use a specially designed writing board on his lap, writing his stories using an HB pencil on a yellow legal paper pad. Roald Dahl wrote for around 4 hours every day. His writing schedule was said to be from 10 am to 12 pm and from 4 pm to 6 pm every single day. Dahl’s first book for children was The Gremlins in 1943. The story was written for Walt Disney Productions and was considered an international success. It sold out the initial 50,000 copies in the U.S. and another 30,000 in Australia. The 1984 movie Gremlins was loosely based on Roald Dahl’s book. The film was written by Chris Columbus and produced by Warner Bros. The film featured evil and destructive monsters which mutate from small furry creatures – very similar to Dahl’s characters. Dahl gave a copy of The Gremlins to First Lady of the U.S., Eleanor Roosevelt. She loved to read the book to her grandchildren. He also gave copies to friends and family, including the British Ambassador in Washington, Lord Halifax. He was writing a third book about the character Charlie Bucket when he died. 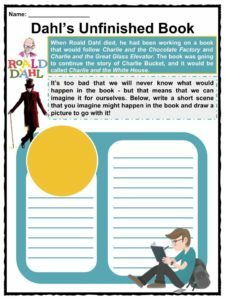 The book was to be called Charlie Bucket and the White House but Roald passed away before it was finished. Roald Dahl may have invented over 250 new words. Many of these words appear in the best-selling children’s book The BFG (short for “Big Friendly Giant”), which was written by Roald and illustrated by Quentin Blake. Roald Dahl was friends with Ernest Hemingway. The two were photographed together in London in 1944. It isn’t known why the two met – at the time Dahl was a first-time author with The Gremlins while Hemingway was a world-famous author. Perhaps Dahl was seeking advice from Hemingway or just wanted to spend time with the great author. James and the Giant Peach was originally going to be called James and the Giant Cherry. It was changed from a cherry to a peach because Dahl said a peach is “prettier, bigger and squishier than a cherry.” The first draft of The Magic Finger was called The Almost Ducks. Dahl’s characters were often based on people he met in real life. For example, it is thought that the grandmother in the book The Witches was based on Roald Dahl’s mother, Sofie. Roald Dahl wrote the screenplay for the James Bond movie You Only Live Twice. He also wrote the screenplay for another Ian Fleming novel – this time for the movie Chitty Chitty Bang Bang. A few of Dahl’s favorite authors were Rudyard Kipling, Charles Dickens and English novelist William Makepeace Thackeray. 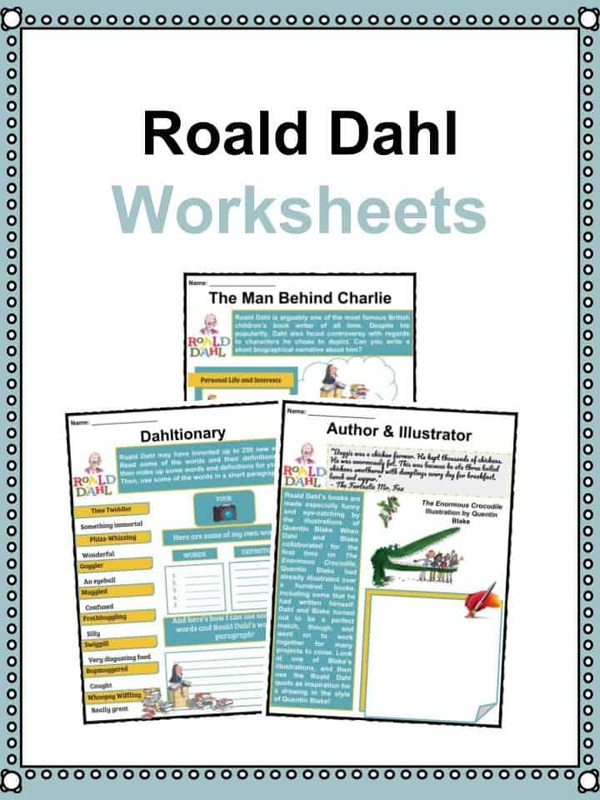 This is a fantastic bundle which includes everything you need to know about Roald Dahl across 23 in-depth pages. 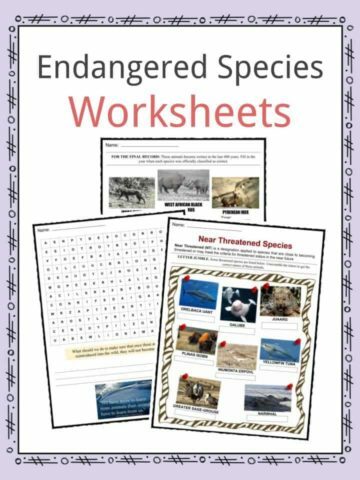 These are ready-to-use Roald Dahl worksheets that are perfect for teaching students about Roald Dahl who was a famous British novelist, short story writer, poet, screenwriter and also served as a fighter pilot in the Royal Air Force during World War II. He has been referred to as “one of the greatest storytellers for children of the 20th century”, writing almost 50 books in his career, along with many more screenplays, poems and short stories.